Sorry for the lousy digiscoped iPhone image, but I wanted to feature the fact that we saw three Red-throated Loons during the Birdathon. One each at Marshlands Conservancy, Edith G. Read Sanctuary, and Aiello Park. These birds should have moved on by now. Well, it sure was an interesting Birdathon this year. The big news items were probably the weather and the almost complete lack of landbird migrants. The decision was made to actually move the Birdathon start time up from 7pm to 3pm on Friday, because of the absolutely dismal weather forecast for Saturday. While wet and at times miserable, the weather wasn't as bad as we thought and we actually managed a fairly birdy day on Saturday. Almost worse, was how quiet it was on Friday afternoon; all the migrants seemed to have moved on and even the resident species were being uncharacteristically quiet (perhaps anticipating the storm?). We only managed 37 species at our first stop despite spending more time at Rockefeller than we probably should have. We initially dipped on a lot of species that we hoped to get early on. Birds Of Note: Red-throated Loon, Barred Owl, Monk Parakeet, Virginia Rail, Brant, Red-breasted Merganser, Black-crowned Night Heron, White-eyed Vireo, Yellow-crowned Night Heron, Hooded Warbler, Worm-eating Warbler, adult Bald Eagle, displaying American Woodcock, nesting Brown Creeper, two Rose-breasted Grosbeak nests, nesting Cooper's Hawk, nesting Cliff Swallows, and a decent selection of shorebird species. So, first I should mention, for those that weren't aware, I tabled the Rockefeller Big Day for this year and expanded out to all of Westchester County. I felt like I needed a change, and I thought it unlikely that I would repeat the spectacular warbler numbers from last year (boy was I right!). It also gave me a chance to experience a lot of fabulous birding areas (such as Ward Pound Ridge Reservation and Muscoot Farm) that I've heard about, but haven't been able to get away from my Rockefeller research to visit. Second, I joined a team this year with David Miller and Eric Reubel. Two top-notch birders that had scouted and planned out an incredible route that was responsible for our success despite the weather. Our first stop was at Swan Lake at Rockefeller State Park Preserve. We began the Birdathon with our scope trained on the Cooper's Hawk nest and got to watch an adult launch off the nest and into the trees. We dipped on the White-eyed Vireo this round, but we had spectacular looks at Orchard Oriole. In addition to the Cooper's Hawk, we also picked up Rose-breasted Grosbeak (x2), American Redstart, Yellow Warbler, and Eastern Bluebird nests. Next was Eagle Hill at Rockefeller, and things were quiet and disappointing. We gained very little, aside from Eastern Pheobe and Wood Thrush nests. The Louisiana Waterthrush singing here at 2:40pm remained completely silent and hidden. Our stop at the fields in front of Buttermilk Hill yielded the desired singing Bobolinks, but we dipped on the Brown Thrasher and Savannah Sparrow we hoped to get there. The entrance fields to Ferguson's Loop provided the needed Solitary Sandpiper and, surprise, the Savannah Sparrow we had just dipped on. We hopped into the car and headed for the Long Island Sound, a bit more confident, but still with great trepidation about our low numbers and missed species. Marshlands Conservancy was gray, cold, and relatively silent on land (we got our feeder Wild Turkeys though). But our luck and confidence changed out on the marshes. We had great luck with shorebirds; getting more diversity than expected. We had American Oystercatcher, Greater Yellowlegs, Lesser Yellowlegs, Willet, Least Sandpiper, Semipalmated Sandpiper, and Semipalmated Plover. We also picked up both Forster's and Common Terns. We also picked up our first Red-throated Loon and a big flyover flock of Brant. An after-dark stop at Aiello Park failed to pick up any Night Herons out on the mud flats, so we headed north. Several stops for owls produced no joy. We wound up the night after midnight at a beautiful freshwater marsh complex near Goldens Bridge, NY. While waiting for our Virginia Rail to call, we also finally picked up a calling Barred Owl. Exhausted (and hungry) I drove back down to Tarrytown to grab less than two hours sleep and replenish supplies. We were supposed to meet at Ward Pound Ridge Reservation at 4:45am, but I was late (body not moving fast on 2 hours sleep). As soon as I rolled into the parking lot, we picked up displaying American Woodcock. More stops in the Reservation produced singing Pine, Worm-eating, and Prairie Warblers, as well as the nesting Brown Creeper and our missing Louisiana Waterthrush. Muscoot Farm provided our missing Hooded Warbler and Chestnut-sided Warbler. While stops along the Cross River Reservoir provided a surprise adult Bald Eagle, our Common Loon, our only true migrant warbler in the form of a Blackpoll, and nesting Cliff Swallow. A stop for Green Heron didn't provide the heron, but did provide our missing Northern Waterthrush. Another stop at David's house did not provide the hoped for Red-shouldered Hawk or Ruby-throated Hummingbird, but did provide needed coffee and a nice bathroom. We dipped at our Bank Swallow spot, before heading south again. A second stop at Swan Lake in Rockefeller proved the charm for White-eyed Vireo, but not for any migrant warblers or the cuckoos we had hoped to pick up here. A quick stop at Devries Park in Sleepy Hollow provided our missing Belted Kingfisher like magic. 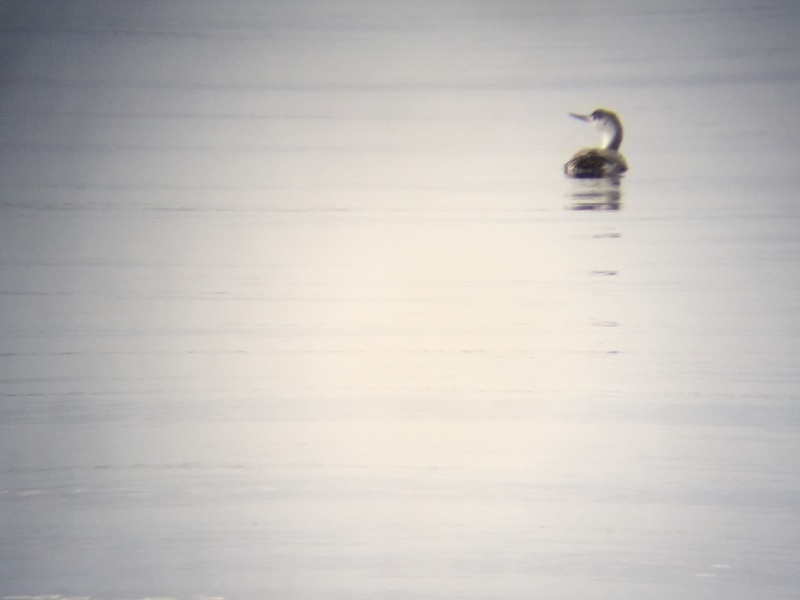 Returning to the Long Island Sound, Edith G. Read Sanctuary provided little besides our second Red-throated Loon of the Birdathon, but it was in nice and close. The winds greatly increased on the coast and the rain continued to become heavier and more steady. A second visit to Marshlands provided Red-breasted Merganser and face-fulls of wind-driven rain. With 103 species and flagging hopes for more with decreasing time and increasing weather, we arrived back at Aiello Park in New Rochelle at around 2pm. Immediately upon exiting the car we picked up our missing Yellow-crowned Night Heron, Black-crowned Night Heron, and Great Blue Heron (I know, I can't believe we were still missing GBHE at this point). Moments later, our missing American Black Duck was found associating with a couple of mallards in the middle of the inlet. Across the street our missing Ring-billed Gull looped lazily around the playground in the gale winds. At this point, the weather temporarily broke our brave friend David (and he's from England), but rain-soaked persistence underneath the Monk Parakeet nests on the light towers produced a few distinctive squawks for our last new species of the Birdathon. In our last half-hour a visit to Glen Island Park at the southwestern-most tip of Westchester County provided a surprising number of good birds for the weather, but alas no Laughing Gull or anything else new for that matter. Soaked to the bone, yet pleased with our performance, we made the long drive back to where we dropped the cars at Ward Pound Ridge Reservation. Excellent summary and great job! Thank you for your dedication and perseverance.